Kaleb came to me a bit older than most of my newborns - most of my newborns are under 10 days old - but he was such a perfect baby for his entire session. Big brother was such a gentleman holding his little brother. 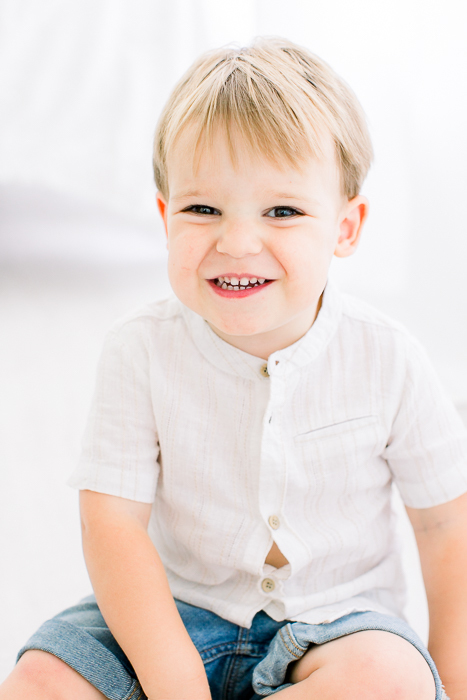 I sometimes have clients who are a bit nervous about including toddler siblings into their session, and as a mother of two toddlers, I completely understand. They always seem to know when their best & most cooperative behavior is needed... and then revert to their basic toddler instincts. I have lots of tricks up my sleeve to make even the most spirited toddler smile (this little guy didn't need to be cajoled at all!) - from "find the sticker!" to pointing out their sibling's tiny nose. This Main Line newborn session had some of my favorite mother and baby portraits; I loved the dress that Samantha chose from my studio wardrobe and the little suspenders for big brother. It was such an honor that this beautiful family drove all the way from Philadelphia to visit me for their natural light newborn session. Here are some of my favorites - enjoy!